Joshue Ott’s Multidraw in action, as an Apple mobile provides wireless, collaborative drawing for anyone. Today, iPhone/iPod touch/iPad, but tomorrow, more computers and devices will be supported. Come learn more in NY, using free (as in freedom) tools – or choose open source tactile controls in LA – or stick around for more online. For computers, digital tech means the ability to turn anything into numbers. For humans, it means a chance to translate between gestures, ideas, sounds, and images. 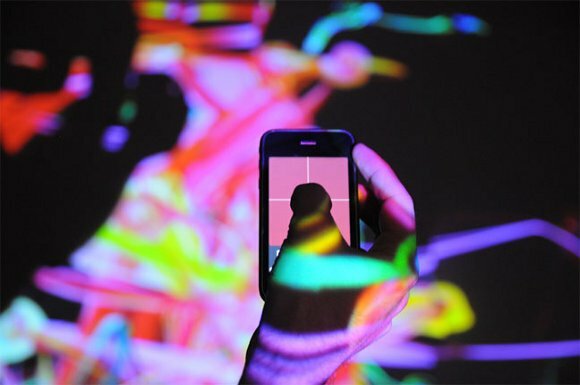 We can interface with musical, visual creations intuitively and collaboratively – now with ubiquitous, cheap touch and electronics. Two events take on that idea on the two coasts of the US; if you’re nearby, hopefully you can drop by, and if not, we’ll have plenty to share. But what if you want to learn to harness some of these same tools in your own work? We have two workshops Saturday, too. 11a-12p, free, Eric Redlinger presents an introduction to mrmr, a demonstration of how to use an iPod touch, iPhone, or iPad for control via OSC. 1p-4p, Joshue Ott and I will teach an in-depth workshop on using OSC for networked communication with free tools, focusing on Processing and Pure Data. We’ll talk about how Zeroconf (implemented by Apple as Bonjour) can create zero-configuration, automatic connections – no IP numbers to type. We’ll look at how you can use OSC to make software and hardware communicate across networks, for sound and visuals. And we’ll talk about how you can use tools like mrmr on mobile devices. $75. Class information, signup required! monome, Arduino. Photo (CC) LA’s workshop teacher, soundcyst. Touch controls a bit too insubstantial for you? Prefer the tactile feel of a physical encoder in your hand? We’ve got you covered there, too. 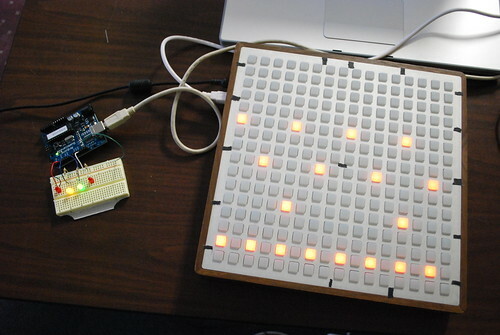 First, I’m going to be giving a high-level talk this Wednesday, April 7 at 8pm on using a Monome to control things in the real world by integrating an Arduino with Max/MSP. The talk is free for members of the space, with a $10 suggested donation for non-members. Second, I’ll be teaching a course on building user interfaces with the Arduino and dataflow languages (I’m trying to make the emphasis on pd because it’s open source, but depending on the audience, Max and Max for Live might slip in there too). The curriculum and description haven’t been posted yet, but should be done and up by the end of the week. The basic idea of the course is to target musicians who have dabbled in electronics and give them the tools necessary to empower themselves to build their own interfaces and instruments. It’s a two day intensive (8+ hrs/day) on May 15 and 16. We’ll be covering basic electronics & sensors, Arduino programming, serial communication between Arduino and pd/Max, and basic pd patching for midi routing or sound generation. The course is $150 for CrashSpace members, and $250 for non-members, and both prices include an Arduino and selection of sensors & misc components for the project. What’s the Best Way to Document? I’ve (ahem) sometimes promised more documentation than I’ve actually delivered, but in the meantime, I have been gradually refining some examples in Processing, Pd, and the like, so I’m feeling less shy about sharing them. Suggestions? The more specific, the more likely I am to implement them. What do you want to see? In what format? Any sites you’ve found useful for this sort of sharing? The more we can share this sort of specific knowledge, the more we as a community can help each other build our skills.